Cowabunga Batman! In celebrating the Caped Crusader's 80th anniversary this year, Warner Bros. Animation is releasing a feature length animated Batman movie featuring the Teenage Mutant Ninja Turtles. Inspired by the stories of the IDW Publishing / DC “Batman/Teenage Mutant Ninja Turtles” comic book cross-over mini-series written by James Tynion IV and Freddie Williams II and utilizing the imagery of Nickelodeon's Teenage Mutant Ninja Turtles cartoons; this animated thriller will be available May 14 via Digital and June 4 on 4K Ultra HD, Blu-ray and DVD. 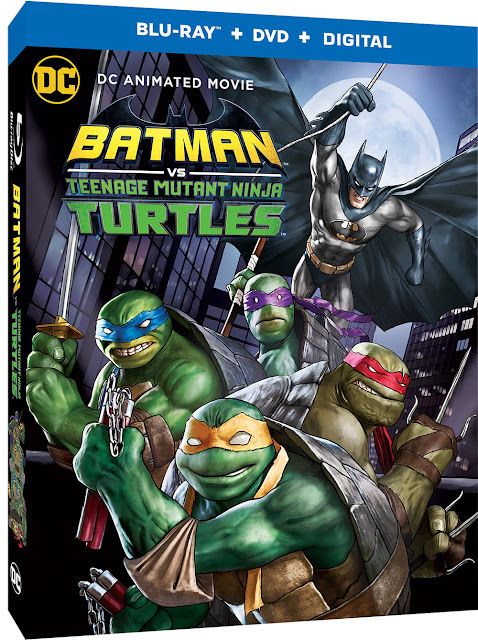 It’ll take the unlikely unification of Batman and the Heroes in a Half-shell to overcome combined villainous forces afoot in Gotham City in this movie that any fan of superhero adventures is going to want to add to their home entertainment video library. Batman vs. Teenage Mutant Ninja Turtles finds Gotham City reaching new levels of danger when Shredder joins forces with Ra's al Ghul to enact a nefarious plan – leading to the team-up of the Dark Knight and the Turtles to combat the combined might of the Foot Clan and League of Assassins! Holy Crossovers Dude! Complementing the film's animation is an all-star cast is led by Troy Baker (Batman: Arkham Origins, The Last of Us) as the voice of both Batman and the Joker – making Baker the first actor to ever play both roles in the same film. Opposite Baker are the Ninja Turtles themselves – Emmy Award/Golden Globe Award/SAG Award winner Darren Criss (American Crime Story: The Assassination of Gianni Versace, Glee) as Raphael, Kyle Mooney (Saturday Night Live) as Michelangelo, Baron Vaughn (Grace and Frankie) as Donatello, and Eric Bauza (Looney Tunes Cartoons, The Woody Woodpecker Show) as Leonardo.